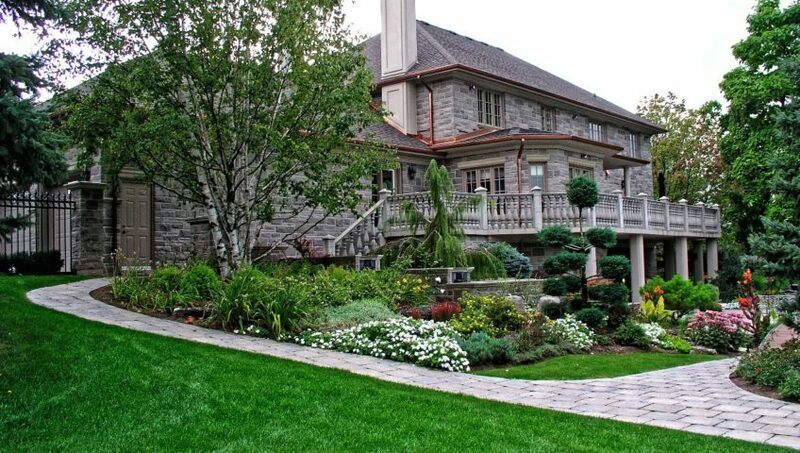 Symmetry was the central landscape design theme for this Neo-Georgian home nestled in the heart of Etobicoke. 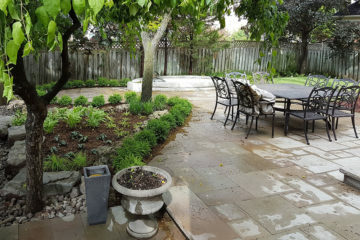 The position of the flowering crabapple tree was used as a reference point whereby intricate interweaving of asphalt, permeable pavers, clay brick and gardens created balance. 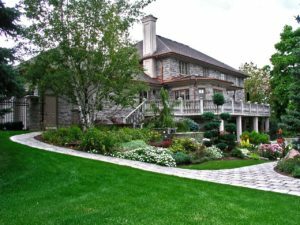 The clean and elegant lines were visually reinforced with masonry pillars, an armour stone retaining wall and flagstone walkway. 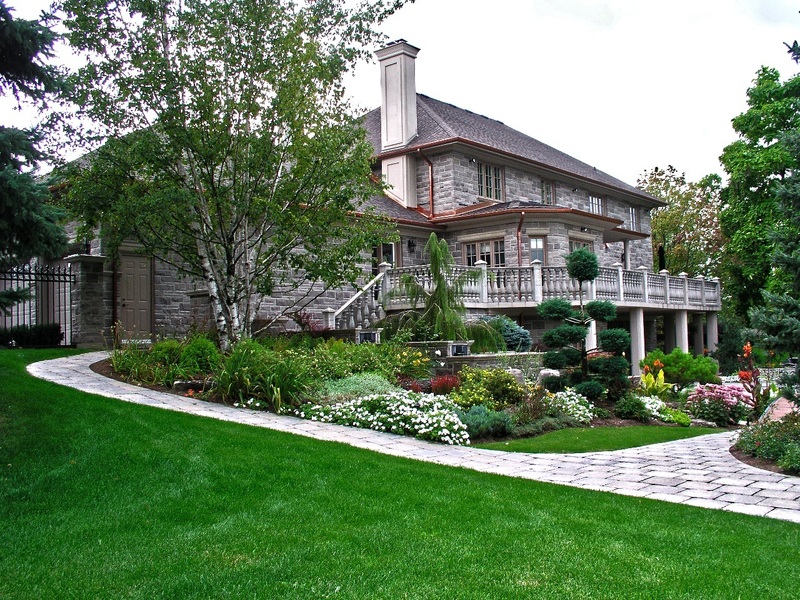 Homeowners and Custom Builders in the Greater Toronto Area require fully integrated solutions on-time and on-budget. The housing market demands quick turnaround times and value-based design themes that satisfy municipal permitting and building code requirements. At Valiant, Pine Valley provided expert consultation and turnkey services in overcoming zoning, city property tree removal and reinstatement, flooding, site servicing, and new design integration with existing structural and site conditions. The purchasers were scheduled to move in, and as as a tear-down new build, time was running out. Deficiencies had to be addressed immediately. The front yard was flooding and excess water undermining neighbouring properties due to a very active sump pump and poor drainage conditions. 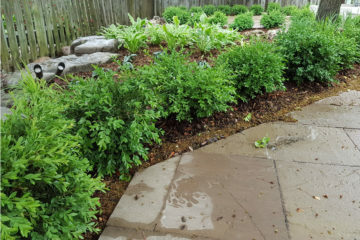 The front yard was regraded, sump pit line buried and redirected to the front swail, a culvert was rebuilt and sloped to the neighbouring catch basin. 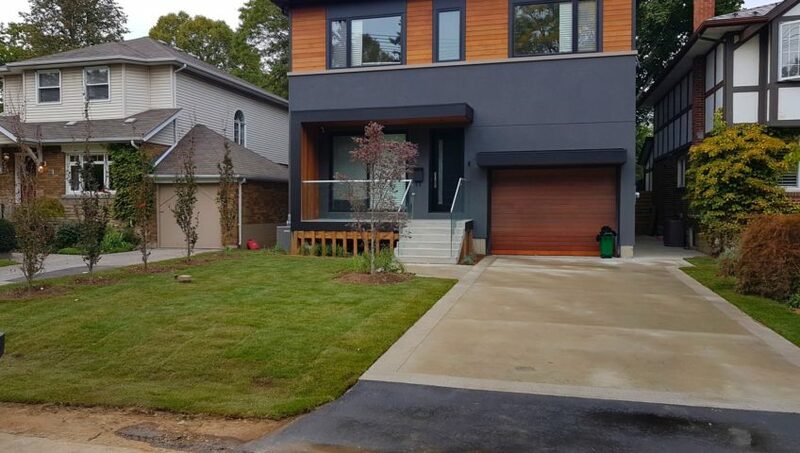 All construction debris, contaminated soil, small trees and shrubs were removed, and the entire property filled and graded to meet-and-match the neighbouring properties and allow for proper water drainage. Water drainage continued by joining the roofs eavestroughs to newly buried piping from the rear of the home to the front road. The ungainly and noisy air conditioner abutting a neighbour was moved and set in a muted grotto. A good start in winning over the neighbours! The skills of Pine Valley’s architectural concrete crews were called upon to provide the needed precision, structural integrity, design flare, and speed. 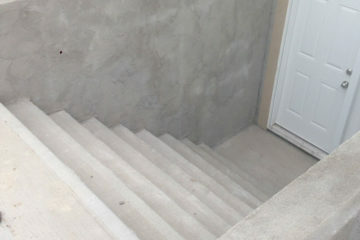 On the front porch, the floating stair system needed to be meticulously formed to accept a prefabricated glass railing system. 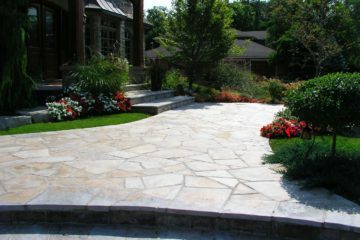 The grooves for the glass could not be too shallow, too deep, too rough or too wide as both concrete and glass expand and contract through summer and winter. 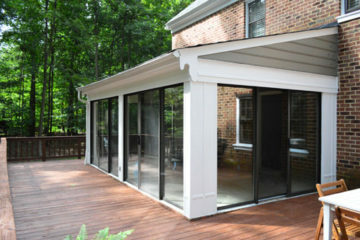 Concrete window wells were custom formed on the sides of the home. What to do with the big basement windows at the back of the house that was built too low for the proper grade (ground elevation)? How do we get the light in? How do we make sure nobody falls 5 feet down? 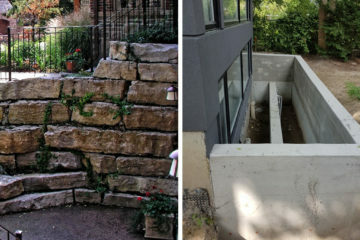 Pine Valley designed and engineered a two-tier concrete window well complete with water drainage, that also functions as a retaining wall. By looking outside the window, you see wood-plank-textured concrete and a whispering grass garden ready to accept LED lighting and further planting in spring. 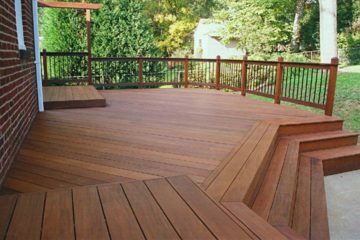 The concrete patio slab extends from the new walkout wood deck and landing. 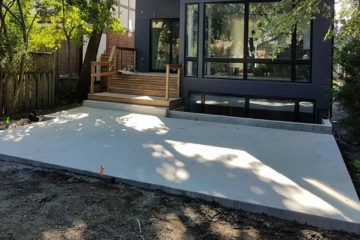 A shared concrete side walkway was negotiated with the neighbour, and work begun on the driveway. To meet the Urban Modern theme of the home, the front walkway and driveway is linear. 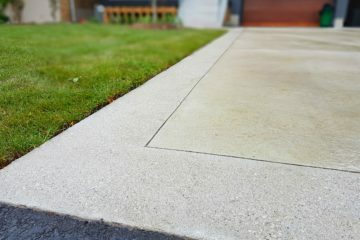 High performance concrete, allows for very subtle textures that differentiate the Valiant’s concrete driveway from all others, as it features a sand-blasted picture frame around an acid-washed slab. Monolithic in look to appear wider, instead of traditional elevated curbs with a boxed-in perspective. The big tree in the front was removed and 7 trees installed in it’s place to satisfy the city. Additional features included: a new wood gate, chain link gate, Sapelli wood frame constructed under the porch, planting and sodding. A flared asphalt causeway was constructed above the front road culvert. 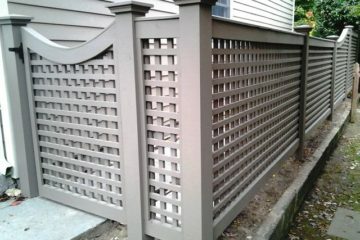 The fencing and gate systems were modified so the owner’s small dog could not squiggle through. 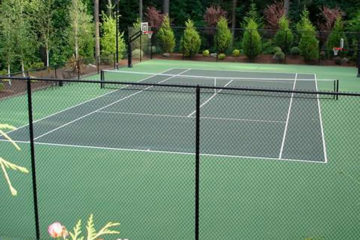 As a goodwill gesture, Pine Valley patched the neighbour’s asphalt driveway which was failing due to the pre-existing flooded site conditions … and helped our client win over the neighbours. The Valiant is Urban Modern. Elegant, clean and simple. By stepping into Stephanie, you are whisked to a majestic and theatrical resort destination designed to accommodate “everyone”. Pine Valley was commissioned by the owner to address the deficiencies of this 3 acre property whereby all topsoil was stripped and 4400 cubic meters of fill was brought in to balance elevations and grade. 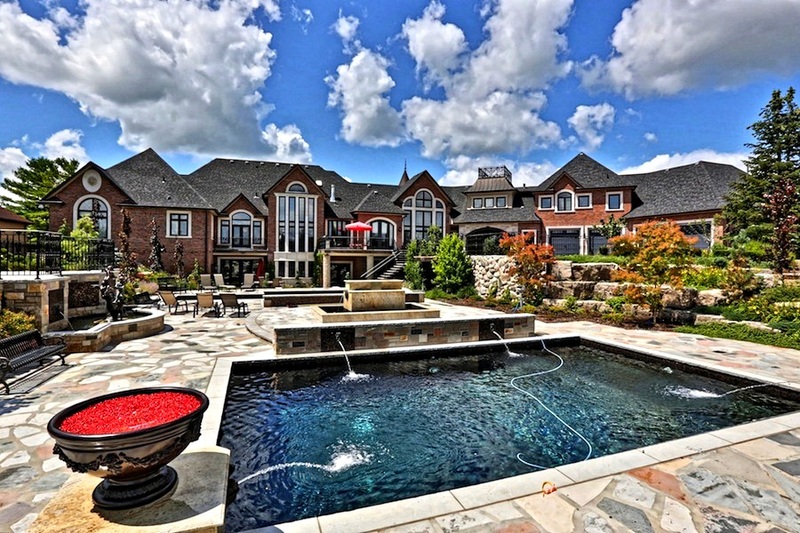 After completing construction of the home, the owner envisioned creating the “dream backyard” that catered to large gatherings of hundreds of people with multiple landscape design themes and private areas for relaxation, conversation, sun or shade. 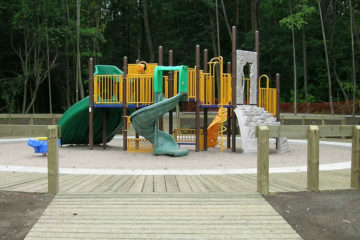 Water elements were integral in unifying and softening the hard surface themes of this residential resort. 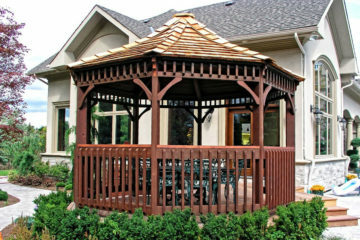 To power all the hydronically heated swimming pools, waterways, fountains and ponds, a special Cabana was constructed to house the intricate mechanical and pump systems. Ground Profiles for the pools and water features were precisely dug out, with piping and electrical systems making their way below ground into the basement area of the Cabana. 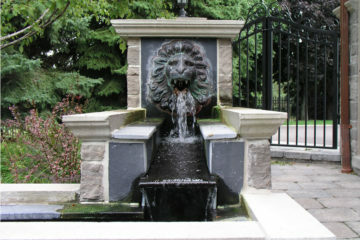 All of the reinforced concrete was formed and poured into place to create custom pools and water features lined with Italian glass tile and accented by commissioned ornamental features including bronze fountainheads and spigots – representing cherubs, lion masks, Neptune and leaves. A 16-person hot-tube with privacy wall on the top landing concludes the water elements. For leisure, patrons enter the shallow pool through a sloped walk-in beach, and can wade under a bridge to find a hidden grotto masked by a waterfall. There’s more. As the water falls, hidden background speakers complement the ambient sounds to create a true private oasis of calm, relaxation and wellness. 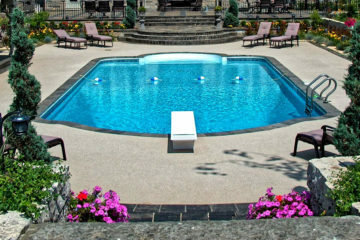 For the more active patrons, a walkout from the center Fire Pit lounge joins a deep pool that challenges the best swimmers. 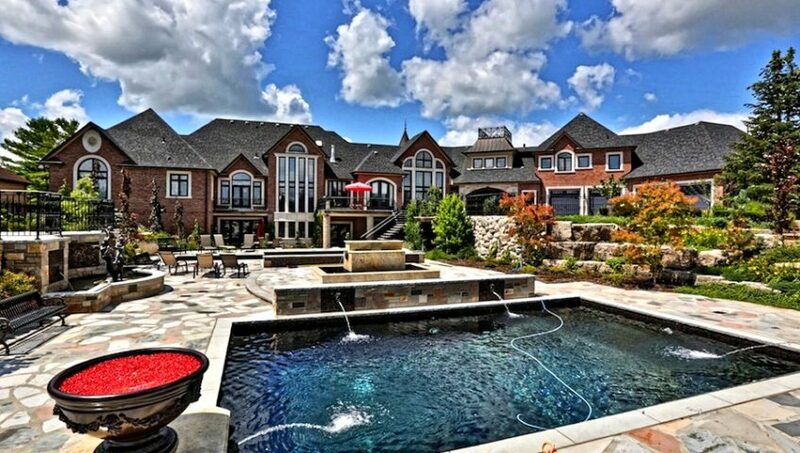 After the vigorous swim, a flight of stairs out of the pool reveals the Cabana area. Sustainable Energies. Photovoltaic panels helped irrigate and sustain the 3 acre property whereby greywater was collected by a system of pool deck drains and elevated eavestroughs stored in 15,000 liter cisterns beneath grade. Like a noble summer residence, enjoy cooling winds and the fantastic view from the gallery of this classical Italian design theme. Patrons arrive upon a wide-berth interlock driveway flanked by stately elevated berms. 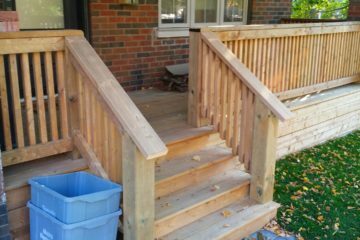 By making your way along a sweeping tumbled interlock walkway and manicured landscape, you will pass the Cabana elevated on an ipe-wood deck and into the square. Children play in the shallow wading pool beside the custom-formed shotcrete swimming pool. 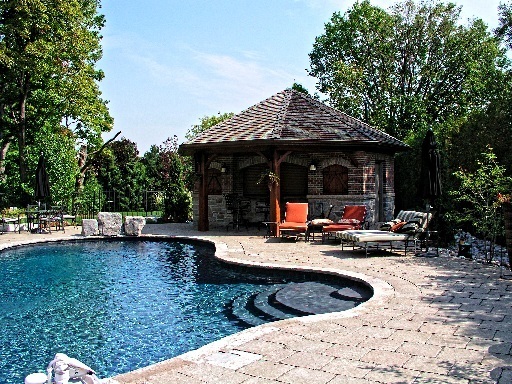 The Eramosa square-cut flagstone used for the pool deck and gallery perfectly match the gallery’s columns and arches. 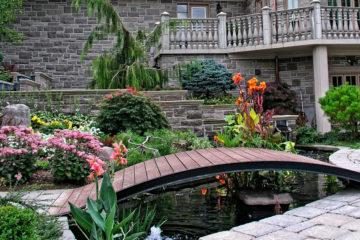 Armour stone retaining walls hold back a continuous perimeter garden which merges onto the ipe-wood walkout deck. 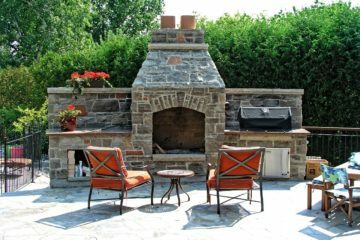 At night, the columnar stone Firepit brings warmth and conversation while low-voltage lighting illuminates the square.